Among his best known novels are The Flood, Knots and Crosses, Watchman, Westwind, Hide and Seek, Tooth and Nail, Strip Jack, Witch Hunt, Bleeding Hearts, Mortal Causes, Blood Hunt, Let it Bleed, Black and Blue, The Hanging Garden, Dead Souls, Set in Darkness, The Falls, Resurrection Man, Beggars Banquet, A Question of Blood, Flesh Market Close, Exit Music, A Cool Head and Doors Open. 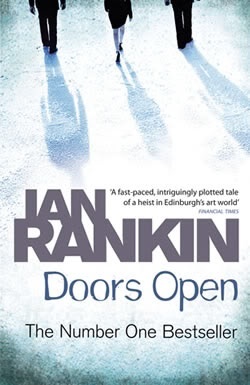 Rankin’s Inspector Rebus novels are set mainly in Edinburgh and are considered major contributions to the Tartan Noir genre. Ten of the novels have also been adapted for a television series on ITV, starring John Hannah as Rebus in Series 1 & 2, with Ken Stott taking on the role for Series 3-5. In 2009, Rankin also recently donated the short story “Fieldwork” to Oxfam’s Ox-Tales project, four collections of UK stories written by 38 authors and Rankin’s story was published in the Earth collection. Rankin’s latest novel include Standing in Another Man’s Grave( 18th Inspector Rebus & 3rd Malcolm Fox novel), Saints of the Shadow Bible (19th Inspector Rebus & 4th Malcolm Fox novel), Dark Road Stage play, The Beat Goes On: The Complete Rebus Stories Short stories And Even Dogs in the Wild (the 20th Inspector Rebus & 5th Malcolm Fox novel).